Nachos are a summertime staple around our house and for good reason: they’re light, delicious, and allow us to use the grill. But quality nachos require more than sprinkling cheese over some chips and microwaving for a minute. That’s where these Grilled Pork Irish Nachos come in. They’re a cross between Irish nachos and traditional Mexican nachos. And they’re delicious! They combine multiple flavor profiles to make for one delicious bite after another. But, like so many good things in life, they take a bit of time to put together. But trust me — it’s worth it. 1. Slice the potatoes into thin rounds, somewhere between 1/8″ and 1/4″ thick. Place each round flat on a baking sheet. 2. Sprinkle the potatoes with season salt, thyme, and rosemary. Then lightly sprinkle olive oil over the potatoes. 3. Bake for 25-30 minutes at 450 degrees (or until cooked through), flipping the potatoes over halfway through. 4. While the potatoes are baking, sprinkle the chili powder on the pork chops and grill until done. 5. Remove the meat from the grill and place on a plate covered with tinfoil for 5 minutes. Then cut the meat into thin strips. 6. Once the potatoes are finished, remove from the oven and place the potatoes on oven-safe plates. Top with the sliced pork and black beans, then cover with shredded cheese. 7. Place the plates with the nachos into the oven and broil until the cheese is melted. 8. Remove from the oven and top with diced tomatoes, green onions, and sour cream. This is our favorite way to do nachos now. Sure, it takes longer than using traditional tortilla chips, but it adds a greater depth of flavor and is more satisfying. Give it a try. Your taste buds will thank you! I’m always looking for ways to spice up old favorites, likes nachos, and these Grilled Pork Irish Nachos look like they will do the trick! I’ve never added pork to nachos before (only ground beef or turkey) so I can’t wait to try this out. Oh my goodness! 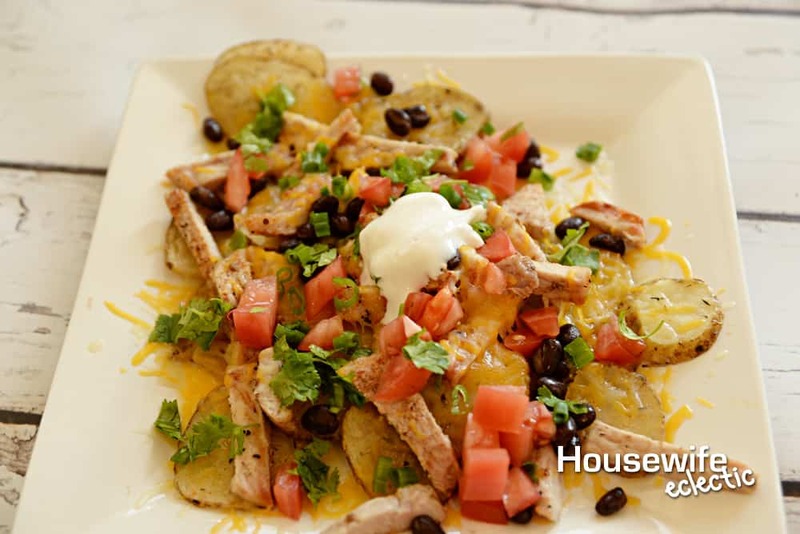 This recipe has taken two of my favorite things and put them together … nachos and potatoes. I just had nachos for dinner tonight and they were great. But adding in potatoes would have made them awesome! This sounds so amazing! I love an easy recipe like this, especially for summer! Nachos are one of my favorite snack items! My husband and I used to go out once a week to our favorite little Irish Bar back in Wisconsin and order a plate of nachos to share. Yum! You had me at nachos. I love anything with cheese, but added pork and potatoes? Yum! I have never heard of nachos without tortilla chips or some kind of chip. I feel like this could be a good recipe even the kids would eat! This sounds absolutely divine! I love how you combined two flavor profiles into one delicious dish! 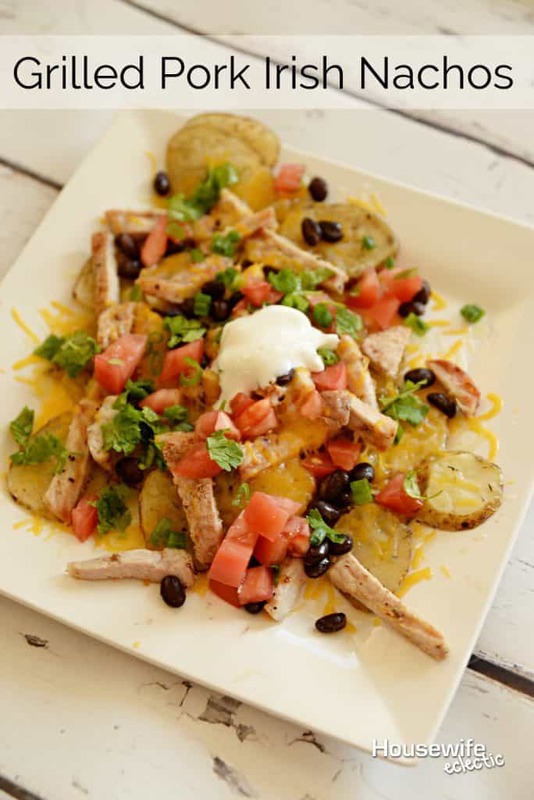 Grilled pork Irish nachos sound delicious. I know my family loves nachos but I have never made them with the potatoes before so this will be interesting. My family will love this recipe. Thanks for sharing the recipe. What an interesting combination of flavors. Looks really tasty and something everyone would enjoy. We eat a lot of pork and chicken in our house so I am always looking for new recipes! These nachos look delicious and like such a treat. Thanks for the amazing recipe. Yum. I like the Irish theme to these nachos. I’ve had BBQ nachos with pulled pork before but not grilled pork. Will have to try these out! Nachos are always a hit in my house. I am always looking for new recipes to mix things up. I will have to give this recipe a try this weekend. I am sure it will be a hit. It’s been a while since I used the grill. I should really try this recipe and have a great time with friends. 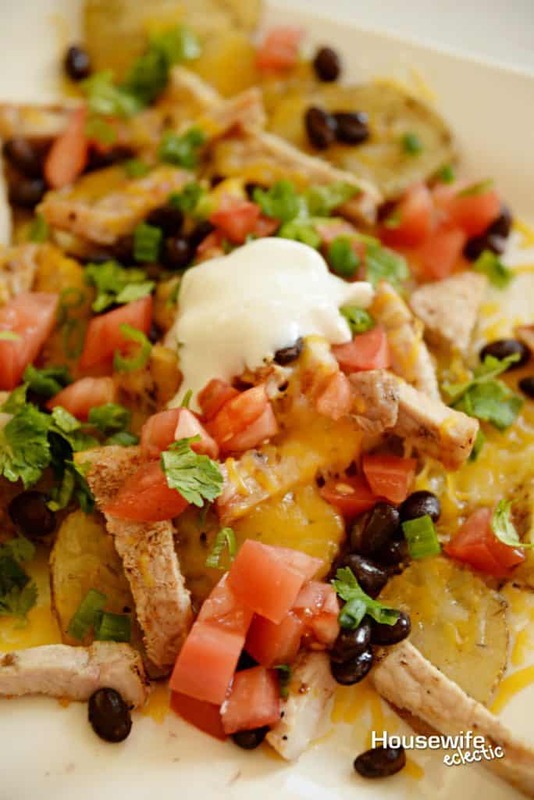 We love nachos and these look amazing! I am going to have to try out this recipe. Hey, when it comes to good nachos, a little bit of extra time is A-OK with me! We love our nachos in this family as well! THese nachos sound deliciously different. I would love to try this recipe for our next girls night in! I have never had Irish pork. I love this idea! Sure it tastes good. I have never heard of Irish nachos and they sound so good! I would love to try them. I love Nachos and it has been a while since I have had some, these look so delicious. One thing I don’t like is when it is not made well. Irish nachos sound fantastic!